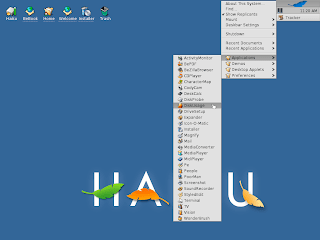 Haiku is an open source operating system that specifically targets personal computing. It is inspired by the now defunct BeOS and reimplements both the BeOS technologies as well as the end user experience. Recently the Haiku team unveiled the first release candidate RC1 by releasing a liveCD of Haiku R1 Alpha1. The Haiku R1 Alpha1 live CD ISO is only 380MB in size. Succumbing to curiosity, and because of its tiny size, I downloaded Haiku live CD and took it for a run. Simply put, I was really impressed with the user interface and the stability of the OS. I found the Haiku Desktop interface to be unique providing a radical approach to desktop computing. Haiku live CD at present is more of a showcase and has little applications to be of any use to the lay person. However, it does bundle with it the Firefox web browser though. One thing which impressed me was the smoothness with which some of the demo OpenGL applications ran - even in a Virtual environment. Below are a few images of the Haiku operating system for your peruse. Haiku at present works only on x86 systems and require a minimum of 128MB RAM. However, it also comes with a few handicaps namely - no wireless support yet, no package management yet, Haiku boot manager supports only a single hard disk, A few device drivers related to printing are missing ... and so on. But hey, that is why it is called Alpha. Read the full release notes to know more. Haiku has a shell similar to the Bash shell and many of the commands are similar to the commands you use in Linux. For example, to know the version of the OS, open Haiku shell and type uname -a, Use ls command for listing directories and so on. 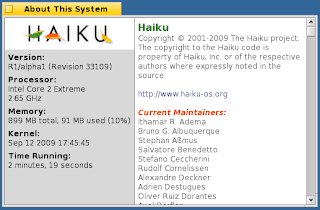 And many open source tools have been ported to Haiku as well. Check out the following video of the Haiku desktop to get a better feel of this promising new operating system based on BeOS. You can download Haiku R1 Alpha1 live CD from its official website. Assuming you have reached this far, I would like to pose a question to you. Suppose Haiku were to have more applications than Linux and if it were to meet all its goals of being a remarkable personal desktop OS, would you ditch Linux ? While answering this question, keep in mind that Haiku is as open source as Linux itself.